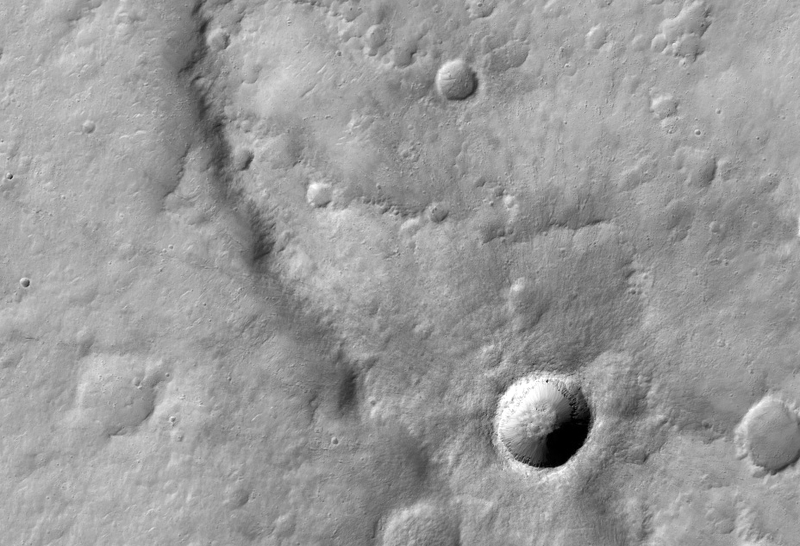 Today's Image of Mars comes from HiRISE and shows an extremely fresh impact crater superimposed over a wrinkle ridge in Hesperia Planum. Wrinkle ridges are low, winding ridges formed when lava first cools and contracts. The often extend for several hundred kilometers. The real prize of this photo is the impact crater on the bottom right. Scientists believe this crater is extremely fresh because the rim is distinct and sharp and the crater's shape has not been modified. Look closely (click on the image) and you will see the faint signs of ejecta surrounding the crater, some of which created secondary craters.